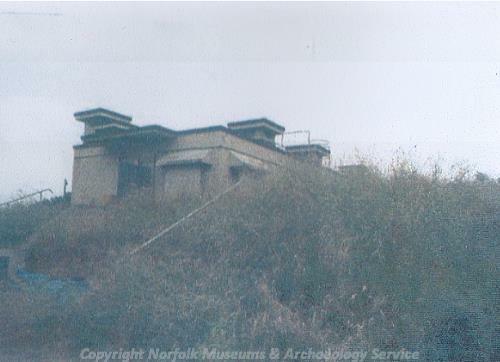 This is the group headquarters of fifty-five Royal Observer Corps Cold War underground monitoring posts in Norfolk, whose purpose was to monitor fall-out in the event of a nuclear strike. Opened in 1961, the headquarters is a two storey semi-sunken structure whose function was to analyse information received about fall-out from the individual posts. When sealed, the building was designed to be self-sufficient for a week under fall-out conditions. The majority of the buildings, however, are visible on aerial photographs from World War Two, suggesting that the origin of the site was during this period. Closed in 1991, it is now disused and access is discouraged. Royal Observer Corps Headquarters, Chartwell Road. Probably early 1950s from design details, however Chartwell Road not constructed until late 1960s. However an earlier small scale map seems to show a building on the site set back from Constitution Hill. (The site is in an odd re-entrant of Broadland District south of the ring road, counted as Norwich for the NHER). Deep underground chambers remain, and ruinous sheds on surface. Now disused. Information from Broadland Council. Survey report (S1) in file. Press cutting in file for NHER 33781. E. Rose (NLA) 29 July 1998. According to source  there was an earlier bunker on the site during World War Two, at that time in an orchard, used for the radar controllers for RAF Coltishall dispersed from Stratton Strawless Hall. The present headquarters was in fact built in 1961. For full description of structure and function see (S2). Plans (S3) in file. E. Rose (NLA), 27 November 1998 and July 2000. See press cutting filed under NHER 33781 as well as press cutting (S4) in this file. Planning permission sought regarding the demolition of derelict sheds and the provision of 600 square meters of retail space with parking. The majority of the buildings are visible on aerial photographs from World War Two (S6-S7) with blast walls around them, and the site remains largely unchanged except for the addition of one or two structures in the post war period (S8-S10), suggesting that the origin of the site was during World War Two. A barrage balloon is also visible to the north of the area during World War Two (S6), centred on TG 2353 1135, as well as a number of zig zag practice trenches. E. Bales (NMP), April 2010. --- Newspaper Article: Eastern Daily Press. 2008. Bid to save relic of Cold War. 20 June. <S1> Unpublished document: Brennan, R.. 2001. Full Survey Report. <S2> Article in serial: Catford, D.. 1999. ROC Underground Posts in Norfolk.. NIAS Journal. Vol 6, No 4. pp 59ff. <S4> Newspaper Article: Eastern Daily Press. 21 Aug 1998. <S5> Unpublished document: lsi architects. 2009. Design and Access Statement, Former Royal Observer Corps Headquarters, Chartwell Road, Norwich. <S6> Vertical Aerial Photograph: USAAF. 1944. US/7GR/LOC348 3193 27-MAY-1944 (NMR). <S7> Vertical Aerial Photograph: RAF. 1945. RAF 106G/UK 772 6331-2 06-SEPT-1945 (NMR). <S8> Vertical Aerial Photograph: RAF. 1947. RAF CPE/UK/2050 5198-9 06-MAY-1947 (NMR). <S9> Vertical Aerial Photograph: RAF. 1951. RAF 58/644 5160-1 20-APR-1951 (NMR). <S10> Vertical Aerial Photograph: Meridian Airmaps Limited. 1961. MAL 61500 95688-9 30-AUG-1961 (NMR).